Pancreatic cancer is a highly lethal tumor type for which there are few viable therapeutic options. It is also caused by the accumulation of mutations in a variety of genes. These genetic alterations can be grouped into those that accumulate during pancreatic intraepithelial neoplasia (precursor lesions) and thus are present in all cells of the infiltrating carcinoma, and those that accumulate specifically within the infiltrating carcinoma during subclonal evolution, resulting in genetic heterogeneity. Despite this heterogeneity there are nonetheless commonly altered cellular functions, such as pathways controlling the cell cycle, DNA damage repair, intracellular signaling and development, which could provide for a variety of drug targets. This review aims to summarize current knowledge of the genetics and genomics of pancreatic cancer from its inception to metastatic colonization, and to provide examples of how this information can be translated into the clinical setting for therapeutic benefit and personalized medicine. Pancreatic ductal adenocarcinoma is a significant health concern worldwide. According to the International Agency for Research on Cancer (IARC), it is the 15th cancer in overall incidence in the world, with an estimated 277,000 new cases diagnosed per year . It is one of the few diseases in which the mortality rate equals the incidence rate; as a result the five-year survival rate for this disease remains a dismal 5%, and this has remained constant over many years. In the US, pancreatic cancer mortality is projected to exceed that of breast cancer in the coming decade [2, 3]. Pancreatic ductal adenocarcinoma is the most common form of cancer affecting the pancreas, and this is the form that we discuss here. There are two predominant reasons why pancreatic cancer is so lethal. First, there are currently no screening methods for identifying it at stages when it could be cured ; it remains largely asymptomatic and thus undetected until it reaches an advanced stage, when surgical resection, the only potentially curative treatment, is not possible [5–7]. The search for sensitive and specific biomarkers of early stage disease is therefore of utmost importance . Second, the chemotherapeutic options for treating it are limited. For many years the standard of care for patients with advanced stage disease has been gemcitabine, even though this drug confers only modest survival advantages on its own [5, 7, 9]. When used in combination with other agents gemcitabine has shown increased effectiveness; for example, the combination of gemcitabine with the epidermal growth factor receptor (EGFR) inhibitor erlotinib has been shown to provide a survival advantage in pancreatic cancer patients compared with gemcitabine alone, although the overall response rate is still low . Gemcitabine in combination with agents to target desmoplastic (fibrosis-causing) stroma, such as Nab-paclitaxel (albumin-bound paclitaxel), has also shown promise, presumably because they deplete tumor stroma, which leads to better delivery of gemcitabine to the tumor cells . Beyond the use of gemcitabine alone or in combination with other agents, preliminary success has been achieved with chemotherapeutic combination regimen FOLFIRINOX (folinic acid, fluorouracil, irinotecan, and oxaliplatin), although toxicities associated with these treatments limit their utility in many patients . Finally, studies are also ongoing to investigate the effectiveness of Hedgehog inhibitors in pancreatic cancer. Inhibition of this pathway has been proposed to target both the tumor stroma and the cancer stem cell population, although success has not yet been achieved in the clinic [13, 14]. Clearly, much progress remains to be made. A summary of chemotherapeutic strategies for pancreatic cancer is shown in Table 1.
aThese regimens have shown promise based on preliminary data in pancreatic cancer or in clinical trials in other cancer types. bIf more than one trial has been reported the range of median overall survivals is listed. In recent years, advances in sequencing technologies have enabled the genetic and genomic events that underlie pancreatic carcinogenesis and progression to be deciphered in great detail. These efforts have greatly advanced our understanding of the key molecular events and mechanisms - for example, the driver genes characteristic of this tumor type and the core signaling pathways to which they correspond. We now also understand the timing of occurrence of these genetic events in pancreatic carcinogenesis and progression, and the implications of this information for targeted therapies in the setting of personalized medicine. Herein, we summarize these discoveries and their potential for improved clinical management of pancreatic cancer. There are four genes that are mutated at high frequency in pancreatic cancer: KRAS, CDKN2A, TP53, and SMAD4 (Table 2); these are referred to as 'driver' genes. The most common of these are genetic aberrations in KRAS (v-Ki-ras2 Kirsten rat sarcoma viral oncogene homolog) at codons 12, 13, and occasionally 61 [15, 16]. KRAS encodes a GTPase that activates downstream effectors of receptor tyrosine kinases, such as the mitogen-activated protein kinase (MAPK) cascades . Mutations in KRAS result in its constitutive activation. Inactivation of CDKN2A (p16, cyclin-dependent kinase inhibitor 2A gene) is also a common event in pancreatic cancer, occurring by intragenic mutation in association with allelic loss, homozygous deletion, or hypermethylation [18, 19]. CDKN2A encodes a cyclin-dependent kinase inhibitor that controls the G1-S transition of the cell cycle; loss of CDKN2A removes this important cellular brake mechanism . Alterations in both KRAS and CDKN2A have been detected at the earliest stages, in pancreatic cancer precursor lesions (called pancreatic intraepithelial neoplasia or PanIN) . However, mutations in KRAS are predicted to precede those of CDKN2A because of a higher prevalence of KRAS mutations in early stage precursor lesions and the observation that most PanIN lesions containing CDKN2A inactivation also harbor a KRAS mutation (Figure 1). TP53 (encoding the tumor protein p53), a master regulator of cell stress responses, is a frequent mutational target in many solid tumors [22–24], and pancreatic cancer is no exception; mutations in TP53 occur in up to 75% of pancreatic cancers, most often by point mutation or small intragenic deletion [23, 24]. Finally, SMAD4 (DPC4, SMAD family member 4 gene), encoding a transcription factor that mediates transforming growth factor-β (TGF-β) and bone morphogenetic protein (BMP) signaling, is affected by homozygous deletion or inactivating mutations and allelic loss in up to 55% of pancreatic cancer patients [25, 26]. Unlike KRAS and CDKN2A, the TP53 and SMAD4 genes are mutated in late stage PanINs, typically PanIN-3 lesions [27, 28] (Figure 1). ‡Effect of mutation: Act, activating; In, inactivating. §Commonly sporadic (S) or inherited (I). ¶This relative risk applies only to patients with germline CDKN2A mutations. ¥Familial pancreatic cancer is defined by three first degree relatives in these studies. Progression model of pancreatic carcinogenesis. Pancreatic intraepithelial neoplasia (PanIN) is an established precursor lesion of infiltrating pancreatic ductal adenocarcinoma that involves the normal ductal epithelium of the pancreas. PanIN lesions develop from normal acinar cells in the pancreas, probably as the result of an activating KRAS mutation, leading to the formation of a PanIN-1 lesion characterized by a tall columnar epithelium lining the duct system but with little nuclear atypia. The development of inactivating mutations in CDKN2A coincides with the progression of a PanIN-1 to a PanIN-2 lesion, characterized by loss of polarity, pseudostratification, papillary formations, and nuclear atypia. Inactivating mutations of TP53 and SMAD4 are late events and most often detected in PanIN-3 stage lesions. PanIN-3 lesions are recognized by their complete lack of polarity, marked nuclear atypia, high nuclear/cytoplasmic ratio, and pseudopapillary formation. Mutations in additional genes may also occur during PanIN formation that are not illustrated in this example. A variety of genes are also mutated at low frequency in sporadic pancreatic cancer, such as TGFBR1, TGFBR2, and ACVR1B, which encode ligand receptors in the TGF-β/activin signaling pathway, and the protein kinase MKK4 [29, 30]. Additional low-frequency targets are germline variants associated with the familial aggregation of pancreatic cancer [31, 32]. For example, germline mutations in the liver kinase B1 gene (LKB1) are associated with the development of hamartomatous polyps in association with Peutz-Jeghers syndrome, and patients with this syndrome have a >100-fold increased risk of developing pancreatic cancer in the context of intraductal papillary mucinous neoplasms . However, LKB1 may also be inactivated in sporadic pancreatic cancer . Inherited mutations in the BRCA2 gene (encoding breast cancer type 2 susceptibility protein, which is involved in DNA damage repair) are perhaps the best characterized of the germline variants [34, 35]. In addition to the increased risk of developing breast or ovarian cancer, BRCA2 mutations are associated with a 3.5- to 10-fold increased risk of developing pancreatic cancer. Following the identification of BRCA2 mutations in familial pancreatic cancer, germline mutations in the Fanconi anemia genes FANCC, FANCG, and PALB2 (FANCN), whose protein product interacts with that of BRCA2, have also been implicated in familial pancreatic cancer [36–39]. Most recently, germline mutations in ATM (encoding the protein kinase Ataxia telangiectasia mutated) have been described in subsets of familial pancreatic cancer families . Table 2 summarizes the somatic and germline alterations in known pancreatic cancer genes, their functions, and the relative risks that they confer. Although the hallmark genetic changes contributing to pancreatic cancer have been well established, only recently has the pancreatic cancer genome been analyzed on a larger scale by whole-exome sequencing. In analyzing the exomes of 17 primary tumors and 7 metastases, Jones et al. reaffirmed the known common genetic alterations in pancreatic cancer and revealed previously unrecognized alterations in genes that have a role in chromatin remodeling (ARID1A and MLL3). Moreover, although they demonstrated that there are several core pathways that are recurrently targeted in most pancreatic cancers, such as those that control cell division, cell death, adhesion, and various signaling pathways , the pathway components that were altered in any individual tumor varied widely (Figure 2). Most recently, Biankin et al. performed whole-exome sequencing in combination with copy number analysis of 99 early stage (clinical stage I and II) infiltrating pancreatic cancers that yielded sequencing data with a high depth of coverage. A pathway-based analysis of this new comprehensive set of mutations confirmed the pancreatic cancer core pathways previously described by Jones et al. . In addition, because of the larger sample size, Biankin et al. could identify novel genetic targets in each core signaling pathway and also many alterations in genes encoding axon guidance factors that are typically expressed during embryogenesis . The relevance of the human genomic data accrued by Biankin et al. was also confirmed in a murine pancreatic cancer model based on transposon-mediated mutagenesis . 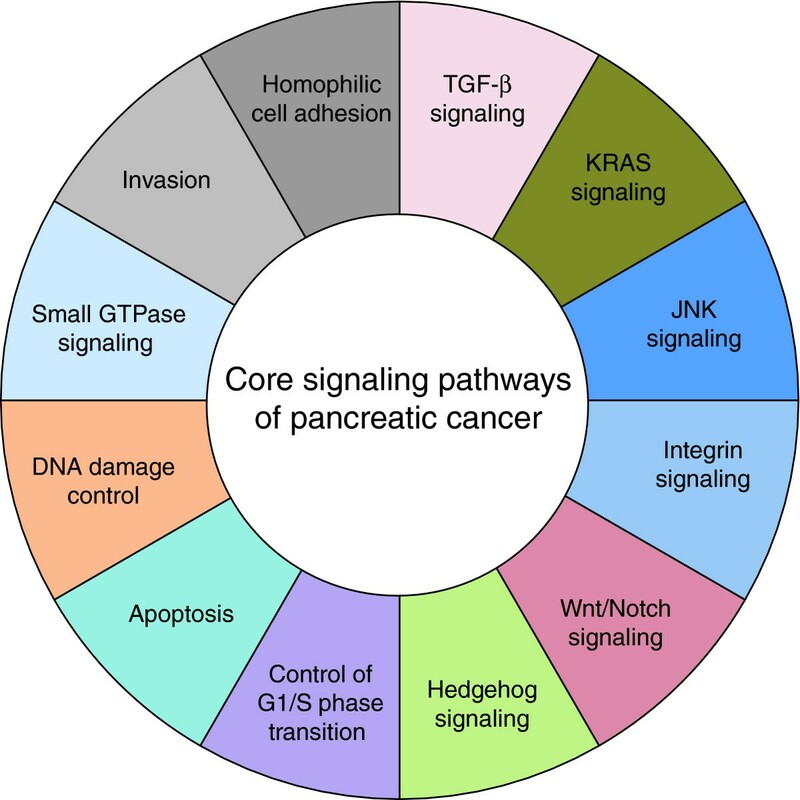 Core signaling pathways in pancreatic cancer. The pathways and processes whose component genes are genetically altered in most pancreatic cancers based on whole-exome sequencing are shown. Although some genes may correspond to a single pathway (for example, KRAS2 mutations and the KRAS signaling core pathway) others may have a role in more than one pathway (for example, TP53 mutations and the apoptosis, DNA damage, and JNK core signaling pathways). Therapeutic targeting of one or more of these pathways, rather than specific gene alterations that occur within a pathway, provides a new way of treating pancreatic cancer. TGF-β, transforming growth factor β. The clinical significance of these findings is that there is extensive genetic heterogeneity among different patients' pancreatic cancers, partly explaining why many gene-based therapies will prove ineffective at targeting a genetic alteration that are present in only a small subset of carcinomas. By contrast, therapies that target core pathways, rather than the diverse genetic alterations that can occur within that pathway, may prove more effective, as such therapies would focus on the convergent phenotypes and not the diverse genotypes observed. Despite these sobering implications for therapy, the genetic heterogeneity observed in pancreatic cancer provides important additional information: the diverse somatic alterations can be used as evolutionary markers to reveal the life history of pancreatic cancer. Such studies are essential for understanding the contribution of genetic mutations to pancreatic carcinogenesis, progression, and metastasis. It has been over 150 years since Charles Darwin first described natural selection as a force in evolutionary change . In 1976, Peter Nowell implicated evolutionary change in cancer when he hypothesized that variant subclones undergo stepwise selection in tumor progression . We now consider cancer to be a genetic disease in which mutations accumulate over time leading to the eventual acquisition of advantageous 'hallmarks' or traits [46, 47]. Moreover, large scale sequencing studies have revealed the various intragenic alterations, copy number variants and chromosomal rearrangements that characterize the many distinct types of cancer . Although Darwin and Nowell provided the overall framework, the current challenge is to translate these concepts of genetic change and clonal evolution in cancer to our ability to diagnose and treat this disease. Metastasis is a key feature of many aggressive cancers, including pancreatic cancer, and is caused by a variety of factors such as changes in gene expression of the tumor cell, the microenvironment, and angiogenesis [49, 50]. However, although the genetic events associated with carcinogenesis are well delineated, the relevance of genetic events to these steps of tumor progression is unknown. To address this lack of knowledge for pancreatic cancer, Yachida et al. reported the combinatorial effects of the four most commonly mutated genes in pancreatic cancer (KRAS, CDKN2A, TP53, and SMAD4) on patient outcome, with the hypothesis that the combination of somatic alterations in these four genes may be the predominant biological features of that neoplasm. The results supported this hypothesis. Patients whose carcinomas had at least three of these driver genes mutated showed a worse prognosis than those patients who had only one or two of these genes mutated in their carcinoma; patients whose carcinomas harbored at least three mutated genes also had high metastatic burden at autopsy. The authors  next evaluated the relationship of each gene specifically to patient outcome. Although no relationships were found for KRAS or CDKN2A, they noted that widely metastatic pancreatic cancer (characterized by hundreds to thousands of metastases present at rapid autopsy) typically arose from carcinomas with TP53 or SMAD4 mutations. Moreover, there were non-random patterns in which genetic alterations in TP53 and SMAD4 coexisted. For example, SMAD4 loss of function almost always occurred in association with genetic inactivation of TP53, whereas the converse was not true. This indicates that SMAD4 alterations are selected for in association with TP53 genetic alterations during PanIN progression. This also suggests that SMAD4 inactivation occurs later than TP53 inactivation in the genetic progression model of pancreatic carcinogenesis (Figure 1). The types of TP53 alterations in pancreatic cancer were also informative. SMAD4 loss most commonly occurred in association with inactivating TP53 missense mutations . In contrast, TP53 inactivation in association with wild-type SMAD4 was highly enriched for nonsense, deletion, or frameshift mutations that abolish p53's DNA binding activity, suggesting that loss of SMAD4 during PanIN progression is selected for because of its cytostatic and apoptotic functions conferred by its own ability to bind DNA in association with SMAD2 or SMAD3 [51, 52]. Collectively, these findings indicate that the genetic features of a primary carcinoma that accumulate during carcinogenesis strongly influence its metastatic propensity. Thus, the genetic features of a carcinoma that can be exploited for the purposes of early detection, for example TP53, might also provide information about the metastatic potential of that carcinoma. The genetic alterations that underlie pancreatic cancer metastasis have also been explored on a more global level [53, 54]. Yachida et al. used whole-exome sequencing data of seven metastases to explore the timing and dynamics of genetic events in metastatic dissemination of pancreatic cancer. 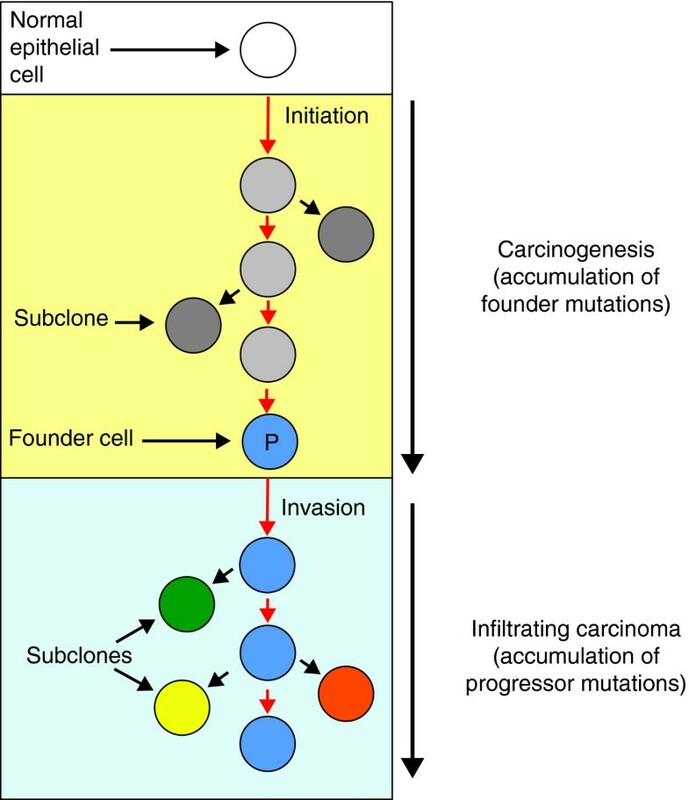 This approach revealed that mutations in a carcinoma could be classified into founders and progressors (Figure 3). Founder mutations are those that are present in all samples analyzed for a patient; from an evolutionary perspective, founder mutations are those clonal events that characterize the 'most recent common ancestor' of all cells in the neoplasm, or the parental clone that gave rise to it. These mutations were acquired during PanIN progression culminating in formation of the parental clone. By contrast, progressor mutations were those that occurred in only a subset of the samples analyzed for a patient. These sets of alterations were acquired later than founder mutations and thus highlight subclonal lineages that arose from the parental clone after the infiltrating carcinoma formed. Importantly, Campbell and colleagues  observed a similar pattern while exploring genomic instability and rearrangements in a set of 13 pancreatic cancer patients. Many genomic rearrangements were shared among all samples analyzed for a given patient, yet subsets of rearrangements were found in only a subset of samples or uniquely to a single metastasis. This study  also described several phylogenetic relationships between the primary and metastatic neoplasms within a patient and also evidence of organ-specific signatures indicating selection for and adaptation of subclones in the new environment. Model of pancreatic carcinogenesis and progression based on clonal evolution studies. Carcinogenesis begins with an initiating alteration in a normal epithelial cell progenitor that provides a selective advantage. Over time, waves of clonal expansion take place in association with the acquisition of mutations in genes such as CDKN2A, TP53, or SMAD4, corresponding to the genetic progression model of pancreatic intraepithelial neoplasia (PanIN). This clonal expansion is expected to generate more than one subclone within a PanIN, one of which will give rise to the founder cell that will eventually become the parental clone (P) of cells that initiate the infiltrating carcinoma. The time taken for a cell with an initiating alteration to accumulate all mutations eventually present in the founder cell that forms the parental clone of the neoplasm is estimated to be at least 12 years . Additional waves of clonal expansion and accumulation of mutations continue to occur in cell lineages derived from the parental clone leading to the formation of numerous subclones and a genetically heterogeneous primary carcinoma. There are at least two conclusions that can be made from genomic studies of pancreatic cancer progression. First, the time required for accumulation of all genetic alterations in a parental clone suggests a relatively long interval for potentially curative screening methods in this disease, in the order of a decade or longer  (Figure 3). Second, therapies that target subclonal genetic alterations (progressor events) will eventually lead to tumor recurrence, as subclones without those alterations will in theory be selected for by such therapies [55, 56]. Therefore, successful approaches will ideally target genetic alterations in the parental clone of that pancreatic cancer (founder events) [53, 54, 57]. A recent study by Haeno and colleagues  using computational modeling further supports this by indicating that pancreatic cancer is commonly in an exponential growth phase at diagnosis. Thus, although it may take many years for a tumor to develop, very little time is needed for the cancer to have significant consequences and aggressive behavior once it is clinically evident. This exponential growth phase probably occurs after the formation of the parental clone, as subclones are continuously created and selected for and as they adapt to the dynamic microenvironment. Only by identifying and targeting the alterations representing the parental clone might we be able to cure this disease by targeted therapies. Approaches for targeting the tumor stroma or stem cell populations of pancreatic cancer also remain viable targets, as evidenced by prolonged survival in patients treated with agents that target them [11, 13, 14]. The ultimate goal of deciphering the genomic changes that occur in pancreatic cancer is to use the information gleaned from each individual patient to guide their treatment. Research in this area is still in progress, but there have been advances in both pancreatic and other cancer models that suggest promising directions. Some success has been achieved in familial pancreatic cancer patients. As discussed earlier, subsets of familial cases of pancreatic cancer arise through inherited mutations in BRCA2, FANCC, FANCG, and PALB2 [34, 36–39]. Cancers deficient in these genes are missing a key component of the double-strand break repair pathways necessary for error-free DNA repair, and treatment of cell lines or xenografts harboring defects in these genes with DNA crosslinking agents has proven a potent therapeutic option by exploiting these deficiencies [59–62]. It was also hypothesized that targeting an alternative DNA repair pathway - such as base-excision repair, in which PARP-1 (poly (ADP-ribose) polymerase 1) is a central player  - would lead to the accumulation of enough DNA damage to result in growth arrest or apoptosis of tumor cells. This was first shown to be true in cell lines (embryonic stem cells, Chinese hamster ovary cells, and MCF7 and MDA-MB-231 cell lines) that were isogenic for loss of either BRCA1 or BRCA2 [64–66]. A subsequent experiment revealed high efficacy of PARP inhibition in Capan-1 pancreatic cancer cells, which have a somatic mutation in BRCA2 . Although these data are preliminary in pancreatic cancer so far, it is exciting to consider PARP inhibitors as treatment options for patients with germline or somatic BRCA2 or related pathway member mutations. Currently, olaparib, a PARP inhibitor, is undergoing clinical trials in breast and ovarian cancers for patients with BRCA1/2 mutations, with 40% response rates reported [68, 69]. It remains to be seen whether PARP inhibition will also be a viable option for treating pancreatic cancer patients with germline or somatic mutations in these genes, and clinical trials to explore this possibility are currently underway . However, because patients with mutations in familial pancreatic cancer genes, such as those described earlier, are relatively uncommon among patients newly diagnosed with this disease, agents that target pancreatic cancer based on more common somatic driver mutations outlined in Table 2 would be applicable to a greater proportion of patients. One strategy for genomics-based therapeutics has been to induce synthetic lethality in cancer cells, in which certain cellular events, if present simultaneously, result in the death of the cell. In cancer, the goal is to discover agents that, in the presence of specific mutations, induce this phenomenon . If possible, it seems that the ultimate target for pancreatic cancer treatment would be the KRAS protein itself, given that it is oncogenic, it is nearly ubiquitously mutated in pancreatic cancer, and it is a mutation found in the parental clone (and thus all cells) of the cancer [16, 41, 53]. However, targeting it has been an insurmountable hurdle so far. KRAS itself does not appear to be druggable, and a recent screen for synthetic lethality with KRAS activation proved ineffective in pancreatic cancer cell lines [72, 73]. Nevertheless, in other model systems there have been genes identified whose inhibition is synthetically lethal with mutant KRAS, including TBK1 (involved in activation of NF-κB), STK33 (a serine/threonine kinase that activates S6K1), PLK1 (a serine/threonine kinase involved in mitosis), and members of the APC/C complex (anaphase-promoting complex) [74–76]. A proposed alternative would be a synthetic lethal screen of cells with CDKN2A inactivation, as this gene is also altered during carcinogenesis in the majority of pancreatic cancers, and is thus also harbored in the parental clone of the cancer [16, 41, 53]. Although limited success has been achieved in targeting KRAS directly, recent studies suggest that targeting its downstream effectors may prove more effective. A recent report from Collisson et al. reported success in treating a model of pancreatic cancer with a combination of pathway inhibitors. Inhibition of the MEK-ERK MAPK signaling pathway was effective in pancreatic cancer cell lines and orthotopic tumors, but activation of AKT (protein kinase B) signaling was induced by this treatment. However, when the authors  treated cell lines with a combination of MEK and AKT inhibitors, a synergistic effect in killing the tumor cells was observed. Given that both of these pathways are activated by oncogenic KRAS, it is intriguing to consider targeting the downstream effectors of KRAS signaling as a bypass to the inability to target mutant KRAS itself. The concept of targeting downstream KRAS signaling is not a new one. Diep and colleagues  found synergistic effects of simultaneous EGFR and MEK inhibition in pancreatic cancer. This was especially evident in cells with wild-type KRAS, but not in those with KRAS mutations. However, certain cell lines with KRAS mutations were sensitive to MEK inhibition alone . These data suggest that downstream inhibition of KRAS may be a promising option for pancreatic cancer patients. Preliminary studies targeting somatic mutations in pancreatic cancer have shown some promise [79, 80]. Synthetic lethality screens in cell lines isogenic for SMAD4 expression identified two novel compounds, UA62001 and UA62784, which selectively targeted SMAD4-negative cells [81, 82]. Of particular interest, the effectiveness of UA62001 was shown to correlate well with overall TGF-β pathway mutational status in a panel of 11 commonly available pancreatic cancer cell lines . More recently, Cui et al. expanded the synthetic lethality concept by examining the efficacies of broadly acting drugs on 18 cell lines studied by Jones et al. plus isogenic cell lines. Cui and colleagues  were able to identify a decreased sensitivity of cells with CDKN2A mutations to gemcitabine and mitomycin C, an increased sensitivity of cells with TP53 mutations to triptolide, a decreased sensitivity of cells with SMAD4 mutations to gemcitabine, and an increased sensitivity of cells with SMAD4 mutations to irinotecan and cisplatin. Although the differences in half maximal inhibitory concentration that were observed with these drugs were significant across these genotypes, the fold changes themselves were relatively small. In an alternative approach demonstrating the utility of unbiased molecular profiling for identifying therapeutic vulnerabilities, von Hoff et al. used immunohistochemistry, fluorescent in situ hybridization, and gene expression microarray analyses of a large series of refractory patient tumors, including pancreatic cancer, to identify differentially expressed genes that interact with a known therapeutic agent. Of 86 patients for which molecular profiling was performed, a molecular target was identified in 84 (98%) patients, 66 of whom were treated according to the results of the molecular profile. Of these 66 patients, 27% had a progression-free survival that was longer than expected from their times to disease progression while on previous failed regimens. This supports the use of therapies targeting specific molecular profiles identified in a patient's tumor tissues. More work will be required to validate these types of studies, but they represent important first steps in identifying genetic-based susceptibilities to therapies used in patients with pancreatic cancer. The complexity of pancreatic cancer from its inception to metastatic colonization is now firmly established, leading to new insights into options for therapeutic targeting based on the genetic features of the neoplasm. For example, it is now evident that the genetic heterogeneity of a pancreatic cancer can be combined into a small number of pathways whose downstream effects can be targeted [16, 41]. Moreover, genetic alterations in cancer can also be categorized by the timing of their development, and those that occur during carcinogenesis may be better targets for therapeutic development as they are contained within every cell of the neoplasm. Related to this, patients with inherited germline mutations in BRCA2 and related genes now have options for chemotherapeutic management that exploit their cancers' defects in DNA damage repair, for example mitomycin C or PARP inhibitors [61, 68, 69]. The elucidation of the pancreatic cancer genome has implications beyond that of treatment, such as for risk assessment or early detection. For example, sequencing the germline of any individual with a strong family history of pancreatic cancer could identify those with a genetic predisposition to the disease, thus prioritizing them for careful screening of their pancreas or other at-risk organs . Moreover, given that most patients do not have a family history of pancreatic cancer, the development of technologies and biomarkers to detect pancreatic cancer while still in the curative stage is of utmost importance. Such a goal is in sight. For example, up to 3% of individuals have a pancreatic cyst that is detectable by computerized tomography , some of which are precursors to pancreatic cancer . The distinction of precancerous cysts from those that do not require clinical intervention remains a challenge, but recent studies indicate this could be done simply by sequencing endoscopically obtained cyst fluid , thereby identifying patients who can be potentially cured by surgical management. Although there is potential for the use of genetic and genomic information to guide pancreatic cancer diagnosis and treatment, how this will be done on a population level remains to be seen. For example, there are still no reliably sensitive or specific markers to diagnose pancreatic cancer in the curative stage [86, 87]. However, considering exciting new data showing the ability to detect cancer DNA in circulating blood- or cell-based assays of patients with colorectal, breast, and gynecological malignancies [88, 89], similar strategies could probably be applied to patients with pancreatic cancer. Such approaches may also help in identifying therapeutic targets. For example, in theory sequencing of circulating genomic DNA may be better than sequencing a single sample of a neoplasm, as the latter does not indicate the extent of its genetic heterogeneity following subclonal evolution. However, the extent to which circulating DNA or shed cells reflect the heterogeneous nature of a pancreatic cancer remains to be determined. Nonetheless, genome sequencing of pancreatic cancers and their metastases has provided invaluable insight into the biological features of this disease, and in the future it will no doubt help in identifying potential therapies. Alvin Makohon-Moore, Jacqueline A Brosnan contributed equally to this work. This work was supported by NIH/NCI grants 140599, CA101955, CA62624 and CA121113, The Skip Viragh Pancreatic Cancer Center and The Sol Goldman Pancreatic Cancer Research Center.